Superman engages Hyathis and she battles him for the location of the Oblivion Stone. Hyathis tries to restrain Superman, but is unsuccessful, and after contending with the Man of Steel to no fruitful outcome, she teleports away. Superman returns home, where he and Lois attempt to answer Jon's questions. Superman gives Jon the cape of his true outfit, after which Jon attempts to fly. He does. Story - 4: A full score couldn't be given for this final issue, much as it was enjoyed, since the utter abandonment of subplots is too blatant to ignore. Superman's return to full-time status means his days of shadow work are done, and things and people, including Hank Henshaw and the Oblivion Stone, will be placed on the wait list... if ever to be seen again. One has to wonder what was in store for Superman in regards to these plot points. The curious loss of power, and trite and hackneyed device, will probably not be explained, either, making even moreso a bromidic conveyance, that was altogether unnecessary. Farewell to the shadow work suit as well, as it's time to put away childish things, like an outfit that identifies a man who wishes to remain unseen. 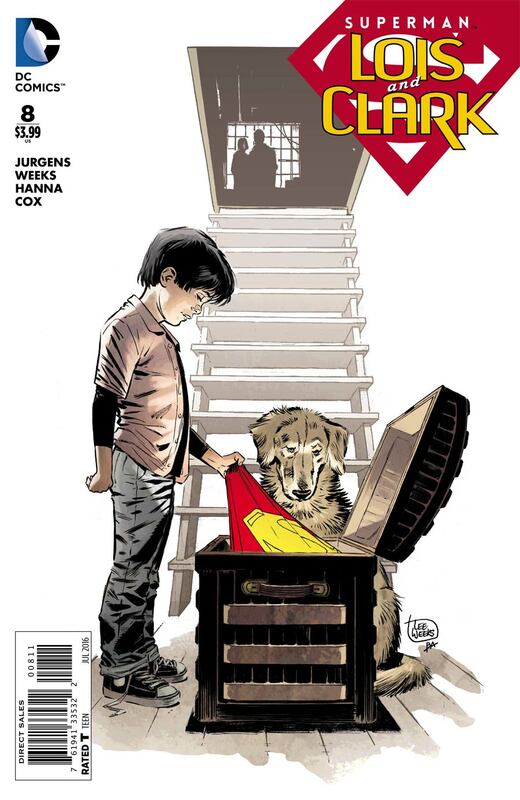 There was much that weighed down Superman: Lois and Clark to the point it fell out of the Top 100 comics in March, and held up the rest of the best at 100, for the month of April. Much like the all too brief Adventures of Superman, many potential readers didn't know the books existed. Those who did, we're skeptical to who or what this Superman was, and no amount of explaining could quell the confusion. More is the pity, as Superman: Lois and Clark delivered quality story telling issue after issue, and provided characterization woefully absent from today's comics, primarily in the form of Jon White, the Son of Superman. Jon's first flight, or hover, is reminiscent of so many instances of Superman's initial launch to the skies, only instead of readers being subjected to Superman's first flight once more, from yet another author who couldn't resist indulging himself (looking at you Max Landis, Scott Snyder, et al) we're given a moment that could only happen in the manner it does and with the characters present. Jon is determined to make flight happen, we can see the determination on his face, but Superman, his father, provides guidance through both his words and even more, by being present. While Jonathan Kent could provide many things, this was an area beyond him, but Superman can render what is needed, and the benefits of the superb nurturing he received from the Kents. Jon relaxes, with a positively Zen look above his years, joins an exclusive legacy and pushes DC Comics towards the future. We will see much more of Jon, Lois, and Superman in Action Comics and Superman, respectively. Dan Jurgens will still have a hand in helming their adventures, and hopefully readers will come along much as they did for the finale of Superman: Lois and Clark, which just happened to sell out in NYC. Hope you had an easier time finding a copy than I did. I honestly believe this is a step in the right direction for DC Comics. Embracing their legacy is definitely the right way to go, as opposed to scuttling so much rich history, but in Jon, they finally have their eyes on the future, not by deconstructing and decimating what came before, but by building, and who better to do so with than The Man of Tomorrow? There has been such a cynical, and almost nasty embrace of the mundane, cynical, and jaundiced, DC Comics seems to have forgotten that while "DC Comics aren't just for kids! ", they don't have to be bleak, hyper-realistic clap trap to service adults, or at least, adults who enjoy comic books. Comics are for the young and the young at heart, those who can still imagine, lose themselves in a thin, 2-dimensional world, that is fuller and possessed of more vibrancy than the average person can contemplate, because the only permanency they have ever required, is room to create and the imagination to do so. Superman: Lois and Clark is a reminder that couples don't have to bicker, kids don't have to be test-tube ninjas to be interesting, and that if an alien from beyond the stars can find love and happiness, just but imitating us, surely we've the potential for the same, as we've a leg up by being human to start with. Art - 5: Weeks has been spot-on from start to finish. His final splash a testament to the fun he's had. Just look at the detail! Jon's hair, the gravity effect on the shirt Lois holds, the contours of the cape. It only happens when you're loving what you do.